Europe faces a moment of transformation, the crisis has not only an economic face but also a social dimension which is currently facing a lot of challenges. Youth are one of the groups that are struggling the most with that reality. All European partners are from countries where youth and graduates’ unemployment rates are among the highest of the EU (see Eurostat “Youth unemployment rate”). On the other side, the economic region of Central America and Mexico is forecast to grow 2.6% this year, while South America is expected to contract 1.9% due primarily to the economic crisis in Latin America’s largest economy, Brazil, which shed more than 1.5 million jobs last year amid its worst recession in over a century. The problem is not just in Brazil. Uruguay has the continent’s highest youth unemployment rate at 22.1% , while Costa Rica has Central America’s highest rate at 22.6% (ECLAC, 2016).In spite of the increasing recognition of entrepreneurship at EU level as a source of job creation, empowerment and economic dynamism in a rapidly globalising world, there has been no a real systematic attempt to look at it from a youth angle. The overall objective of the project is to transfer to youth workers innovative training methodologies to improve guidance and counselling, vocational and non-formal training in EU and Latin America for youngsters and young NEETs who are facing more difficulties to enter on the labour market and thus, are more vulnerable to be at risk of social exclusion. The project aims at fostering entrepreneurship education, including social entrepreneurship, in our target group through a high quality project which improves youth workers entrepreneurial skills and therefore their abilities to provide assistance to young people. This project will develop youth workers’ set of technical, transversal and intercultural skills and competences and indirectly may open for the youngsters of partners’ local community new job opportunities and improve their employability. 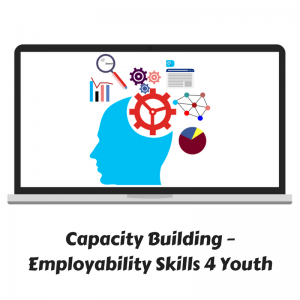 The Employability Skills 4 Youth (ES4Y) project plans to build the capacity of 10 youth organizations through a series of inclusive mobility initiatives aimed to develop experiential and non-formal learning methods of work with marginalized youth. This project will contribute to the implementation of “Europe 2020” strategy, working specifically in the fight against poverty and social exclusion of youth. Project partners will collaboratively prepare a capacity building programme which will be passed on to other youth workers in their countries to increase their organizations social impact and visibility. ES4Y aims to promote peer learning between youth workers of different continents based on creativity, active participation and intercultural learning. Create innovative tools related to the inclusion, based on the exchange of experiences and best practices, development of new skills and peer learning; a set of videos to share on social media, an interactive blog with the best practices from the different continents. Development of a website and the online platform, Implementation of e-learning courses (in all languages of the Partner Organizations). Digital guide to all the necessary skills for employers to facilitate the creation of jobs.